New York’s Attorney General Eric Schneiderman, a high-profile figure in the #MeToo movement against sexual harassment, on Tuesday abruptly resigned hours after he was accused by four women of physically assaulting them. Schneiderman, who had been running for re-election, rose to national prominence as a foe of the Trump administration. “It’s been my great honour and privilege to serve as Attorney General for the people of the State of New York,” 63-year-old New York state’s top prosecutor said in a statement released. In a statement, New York State Governor Andrew Cuomo had called for Schneiderman’s resignation saying it is not possible for him to continue serving as the Attorney General. “The New Yorker has published an article on Attorney General Eric Schneiderman, which reports multiple women making serious allegations of assault. No one is above the law, including New York’s top legal officer,” Cuomo said. He said he will be asking an appropriate New York District Attorney to commence an “immediate investigation” and proceed as the facts merit. “My personal opinion is that, given the damning pattern of facts and corroboration laid out in the article, I do not believe it is possible for Schneiderman to continue to serve as Attorney General, and for the good of the office, he should resign,” the NY State Governor said. The resignation came as a stunning fall for Schneiderman, who has been seen as a Democratic champion of women’s rights and was also an outspoken person in the #MeToo movement against sexual harassment. An article published by The New Yorker said four women, who had been romantically involved with Schneiderman at some point, accused him of physically assaulting them. The women accused Schneiderman of “having subjected them to non-consensual physical violence,” the report said. While all the four women have been reluctant to speak out, fearing reprisal, two of them Michelle Manning Barish and Tanya Selvaratnam spoke to The New Yorker on the record. “They allege that he repeatedly hit them, often after drinking, frequently in bed and never with their consent,” the report said. According to the report, a third former romantic partner of Schneiderman’s told Manning Barish and Selvaratnam that he also repeatedly subjected her to non-consensual physical violence. A fourth woman, an attorney who has held prominent positions in the New York legal community, said that Schneiderman made an advance toward her and when she rebuffed him, he slapped her across the face with such force that it left a mark that lingered the next day. Schneiderman had been seen as a strong advocate for women’s rights and had announced that his office was filing a civil-rights suit against disgraced film mogul Harvey Weinstein, after he was accused by several women of sexually abusing them for decades. The New Yorker report added that Schneiderman’s activism on behalf of feminist causes had won him praise from women’s groups. Earlier this month, the New York-based National Institute for Reproductive Health honoured him as one of three “Champions of Choice” at its annual fund-raising luncheon. The report also quoted novelist Salman Rushdie as saying that Manning Barish had confided in him. The report said that Rushdie had dated Manning Barish before Schneiderman did. “She called me and told me he had hit her,” Rushdie said in The New Yorker report. 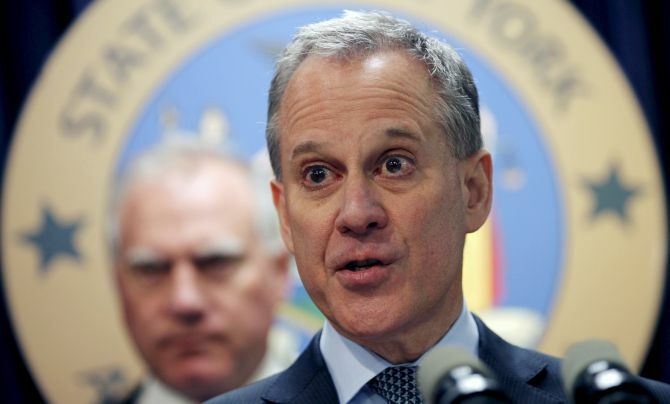 A report in The New York Times said Schneiderman has long been regarded as one of the state’s most progressive politicians, even before his 2013 lawsuit against Trump University and his subsequent suits against the Trump administration. In 2010, as a state senator from Manhattan, he introduced a bill to make intentional strangulation to the point of unconsciousness a violent felony. His office has also published a “Know Your Rights” brochure for victims of domestic violence. “We must recognise that our work keeping New Yorkers safe from domestic violence is far from over,” Schneiderman said in the announcement for the 2016 brochure. Why is everyone talking about #MeToo?